- Racing Events: Checking out everything from track days at the Circuit, to Drag racing, and much more! A definite fill for the motor racing lovers! 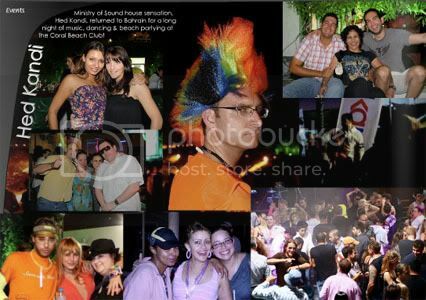 - Hed Kandi: The house music sensation, Hed Kandi is in town, and brews up a storm of a party on the beach, entertaining crowds till the early hours of the morning! 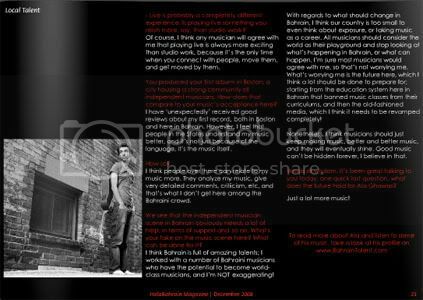 - Ala Ghawas: Bahraini sensation and soon to be superstar, in an exclusive interview with us! We talk o him about how he started, what inspires him, and much more! - Also in this issue: The AMA car show, bringing custom autos and bikes, Nemr live stand up comedy, the Red Bull Street Style competition bringing out the best new footballers, Aldar Lunar party on the beach, local Bahraini sweets (Halwa) and where you can try it, and more!